Make your own discovery of the natural wonders of Antarctica and the Antarctic. Your guide is our current and historical maps, posters, satellite images, and aerial photography. Use and enjoy these in the field, office, classroom, and home. Use this 1:1,000,000-scale map to examine the status of this fantastic ice-free zone of Antarctica with its mysterious Lake Vanda. Ferrigno, Jane G and others. This map contains fewer labels than Map I-2284 and therefore it is useful to examine the surface of Antarctica. Use this map of the entire Antarctica continent from a	mosaic of satellite images to teach and learn about the	physical geography of the continent. 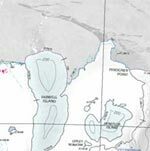 Use this satellite image map to investigate the landscape of Hut Point Peninsula, near 77° 50' South and 166° 45' East, at 1:25,000 scale. Use this map to investigate the landscape of Mt Discovery Sound at a scale of 1:250,000. Use this map to investigate the landscape of Plunket Point at a scale of 1:250,000. Use this map to investigate Antarctica at a continental and yet a detailed scale, as the mosaic was made from 25- meter resolution imagery. Use this satellite image map to investigate the landscape of Marble Point near 77° 35' South and 164° East, at 1:25,000 scale. 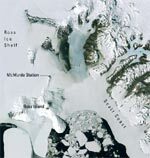 Use this map to investigate the landscape, ocean, and ice at Ross Island and McMurdo Sound at a scale of 1:100,000. Contains index map showing the locations and names of the 23 published and planned 1:1,000,000-scale coastal-change and glaciological maps of Antarctica. The dates (2004) of published maps are shown that are available in print and digital formats. By Charles Swithinbank et al. Use this 1:1,000,000-scale map to examine the status and changes in the Eights Coast area of Antarctica via satellite imagery. The USARC holds approximately 400,000 aerial photographic prints from 1947 to the present. The photography was flown in support of NSF funded mapping and research by the USGS. These prints are spatially indexed and viewable in the USARC or are available online through a link from the USARC web page. 2) By visiting the USARC in	Reston, VA.
3) Although flight indexes, coordinates and map names can be viewed and downloaded from the internet (URL above) photographic prints must be ordered through the Center for Earth Resources Observation and Science (EROS). 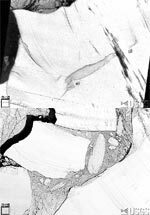 The Scientific Committee on Antarctic Research (SCAR) provides aerial photography and maps of Antarctica for scientists and others to determine geologic features, analyze ice stream flow, and monitor penguin and seal populations. Various mapping cameras and film types have been used to create over 300,000 frames of film since 1946, with annual acquisitions since 1980. Examine Antarctica using aerial photography. The original negative film is stored at the USGS EROS Data Center. The USGS archives all film taken over Antarctica and held in the U.S. except for some photographs acquired during 1946 - 1948, which are stored in Washington, DC at the National Archives. The USGS maintains a SCAR library which is a repository and distribution site for all cartographic materials covering Antarctica that are produced by the United States and other participating SCAR nations. The SCAR library is located at the USGS National Center in Reston, VA.
What does the land look like at the South Pole? Use this map/aerial photograph to find out. This map is quite detailed (1:1250), allowing close investigations of people and activity. Use this aerial photo map and accompanying ground photo to investigate the landscape of McMurdo Station and human activity at a detailed scale of 1:1560. Use this map/aerial photograph to investigate rocks, ice, and human activity at a detailed scale (1:13,500). Use this site to examine changes that can be detected via Landsat satellite imagery, and read the explanatory text provided. Investigate seismicity of Antarctica with this data library. Some of the links on this page require a plug-in to view them. Links to the plug-ins are available below.